Seventy civil service mariners, and approximately 400 Navy, Army and non-governmental organization (NGO) personnel aboard Military Sealift Command hospital ship USNS Mercy (T-AH 20) returned to San Diego Sept. 14. They steamed more than 20,000 miles - nearly the distance of circling the equator - to Indonesia, the Philippines, Vietnam and Cambodia as the lead vessel for Pacific Partnership 2012 (PP12), in a nearly five-month humanitarian and civic assistance mission that resulted in medical treatment for nearly 50,000 people. Many of the ship's mission personnel - which total about 1,200 service members and civilians - have already returned home. 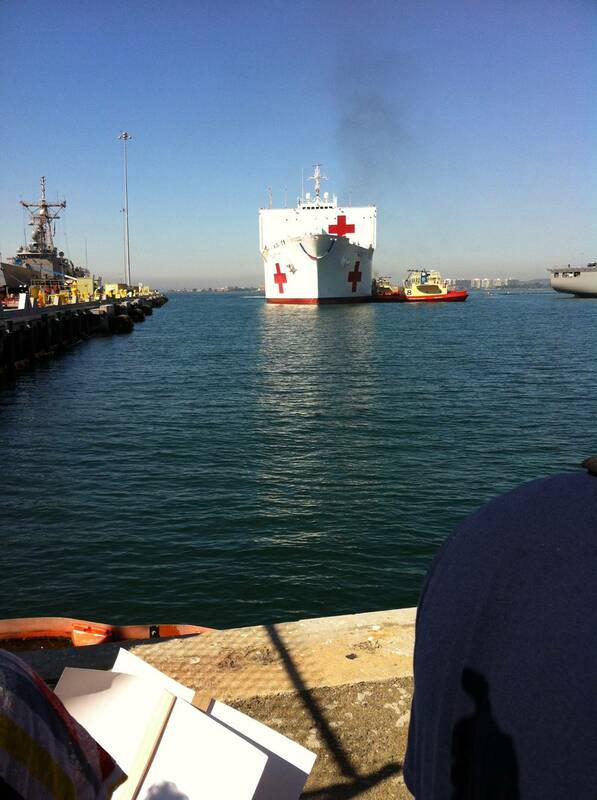 The 894-foot Mercy, one of two U.S. Navy hospital ships, is operated by the U.S. Navy's Military Sealift Command. MSC's civil service mariners were responsible for Mercy's operation and navigation. In addition, since the ship is too large for pierside visits, mariners operated small boats to transport patients and personnel between ship and shore. Doctors and nurses from the ship's U.S. Navy Bureau of Medicine and Surgery-led medical treatment facility worked with medical professionals from numerous governmental agencies, non-governmental organizations and the host nations to provide medical care, including immunizations, general and specialty surgeries, dental care and vision services. At the invitation of the host nations, PP12 brought the expertise of U.S. service members and personnel from 13 partner nation militaries and 28 NGOs to build and strengthen relationships and work together to learn how to better collectively respond to natural disasters and crisis. As part of the medical outreach effort, which took place both ashore and aboard the ship, Mercy's team treated more than 49,000 people ashore, including dental care and services like the distribution of eyeglasses and sunglasses. The team performed more than 900 shipboard surgeries, and treated or evaluated more than 7,000 livestock and domestic animals. In addition, the Mercy team conducted more than 60,000 hours during 62 subject-matter expert exchanges in the four countries visited on topics including first aid, nursing, cardiology, orthopedics, nutrition, disaster response, water and food safety, and public health promotion. U.S., Australian and host-nation engineers built or refurbished 13 buildings and the crew collectively participated in more than 100 community service projects to include the delivery of 244 pallets (more than 144,000 pounds) of donated supplies requested by host nations. Pacific Partnership 2012 is a U.S. Pacific Fleet mission led by three different element commanders: civilian Capt. Jonathan Olmsted, Mercy's civil service master; Navy Capt. James Morgan, commander for the overall Pacific Partnership mission; and Navy Capt. Timothy Hinman, commander of the medical treatment facility responsible for providing care aboard Mercy and ashore. "My most profound memory was watching six surgeries - all of which were performed in a 30-minute timeframe while we were anchored off the Philippines," said Olmsted, who has overall responsibility for Mercy's movement and the safety of its nearly 1,000 passengers. "We saw four children and two adults receive life-changing procedures including cataract transplants, tumor removals, and other corrective surgery. That's when it really hit me why PP12 is so important." Supply utilityman Carmelita Kawasaki said that the mission's success is evident from the facial expressions of those receiving help. Kawasaki noticed this especially while volunteering her sleep hours to work at a public elementary school in Indonesia. "You can feel the gratitude and happiness in their hearts, and sense that we are very welcome in their place," she said. Engine utilityman Darlene Mertz, who works in Mercy's vast, engineering spaces, cites a memory from Vietnam as her favorite from the trip. "I was walking down a ship's passageway after a long and hot eight-hour watch in the engine room when I ran into a group of patients," said Mertz. "An elderly woman stopped me and asked, via her translator, what I do on the ship. I told her I work in the engine room keeping the boilers on so we have steam for the ship's propulsion and power for the hospital. She looked at me and said, 'thank you for being here.'" Military Sealift Command operates approximately 110 noncombatant, civilian-crewed ships that replenish U.S. Navy ships, conduct specialized missions, strategically preposition combat cargo at sea around the world and move military equipment and supplies used by deployed U.S. forces.